Professional carpet cleaners must be prepared to tackle a huge range of carpet stains and odours. Take a look at our top 5 must have carpet cleaning chemicals to find out how to professionally clean and freshen carpets, rugs and upholstery fast! To get the best carpet cleaning results, the correct carpet cleaning chemicals should be included in your kit. Professional carpet cleaners are faced with an array of carpet cleaning challenges; their customers demanding great results at affordable prices. We’ve put together a list of our top 5 must have carpet cleaning chemicals to help you select just the right carpet cleaners and treatments for your professional carpet cleaning kit. A professional carpet cleaner must be able to quickly tackle all kinds of dirt, stains and odours which may be present on their customers carpets, rugs or upholstery. 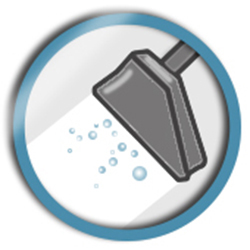 Using the right cleaning chemical or treatment means that you can achieve the best results quickly and easily. Among the most common types of staining and odours on carpets are red wine stains, coffee and tea stains, vomit stains and odours and pet urine stains and odours. In order to tackle these common, but tough stains and odours, a professional carpet cleaner must have the correct carpet cleaning treatment for the job. We have chosen all 5 of our must have carpet cleaning chemicals from the Prochem brand. Prochem manufacture a huge selection of carpet cleaning chemicals, stain treatments and odour neutralisers. Their range also extends to protective treatments for carpets, rugs and upholstery to protect fibres from future stains and dirt build-up. Prochem also manufacture a range of carpet cleaning machines, a great choice for professional carpet cleaners who want an economical, easy to use, high quality machine to tackle tough carpet and upholstery cleaning jobs. 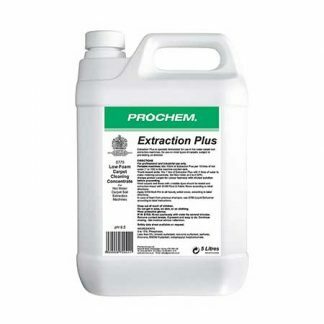 Prochem Extraction Plus is an economical liquid carpet cleaning detergent, made for use with your extraction machine. Extraction Plus can be used at high temperatures (Some carpet cleaning chemicals become unstable when used with heat) to provide a deeper, more thorough clean. Extraction Plus will loosen and break down tough soiling so that it can be easily removed with your extraction machine. It has a fresh citrus fragrance which leaves carpets and rugs smelling great. 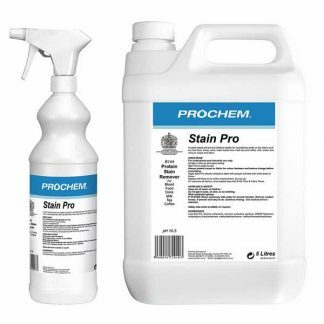 Prochem Stain Pro is a highly effective stain treatment, formulated to break down the protein molecules in common stains found on carpets and rugs such as food stains, wine, tea and coffee, vomit and blood stains. Stain Pro is incredibly simple to use and delivers fantastic results fast! The liquid should be applied directly to the stain where it will break down the stain molecules. The area should then be blotted with a clean, white cloth. Prochem Prespray Gold is a highly effective traffic lane cleaner which should be applied to heavily soiled areas of the carpet before an extraction clean. The liquid pre-spray should be diluted with water and applied by sprayer directly to the soiled areas. Prespray Gold will help to loosen heavy, trodden-in dirt, allowing it to be removed easily with your extraction machine. 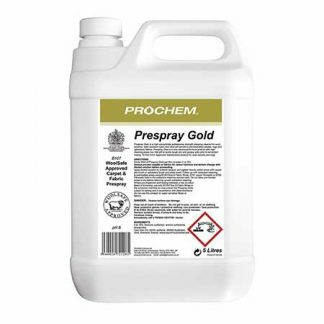 Prespray Gold also helps to freshen the carpet with its fresh floral lemon fragrance. Prespray Gold is woolsafe approved so that it works gently on delicate fibres. 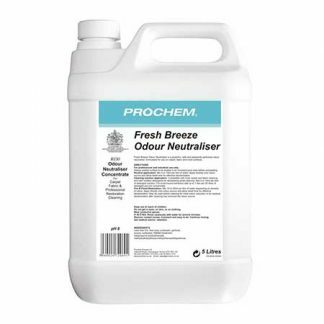 Prochem Fresh Breeze is an economical and powerful deodoriser. It is suitable for use on carpets, fabrics and hard surfaces to quickly neutralise any odour and freshen the carpet, fabric or surface with a pleasant perfume. Fresh Breeze should be diluted with water or added to your usual surface or carpet cleaning solution. It should be sprayed or mopped directly onto the surface to be deodorised and be left to dry fully. 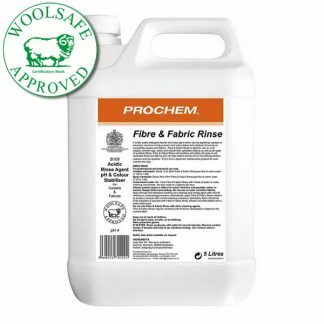 Prochem Fibre & Fabric Rinse has been formulated to restore the PH balance to carpets, rugs and fabrics after extraction cleaning or treatments have been carried out. It will prevent colour bleed and stop browning or yellowing stains. It is also effective in neutralising urine contamination. Fibre & Fabric Rinse is woolsafe approved, and so it is a great choice for use on natural fibres such as wool and cotton, as well as on synthetic fibres. Fibre & Fabric Rinse should be diluted with water in your extraction machine’s tank and used as a final rinse to restore balance and to stabilise the colour of the carpet or rug.